Welcome to Web home of DC Black Pride. We are elated to have you stop by and pay us a visit. Take a few mintues, hours, days, months, or years to explore our website to learn more about the Black Pride that started the Black Pride Movement. Since 1991, DC Black Pride (DCBP) has been held annually during Memorial Day Weekend in our nation's capital — Washington, D.C.
DCBP is the inspiration for numerous annual Black LGBT pride events in the United States, Canada, United Kingdom, Brazil, Africa and the Caribbean since its founding. 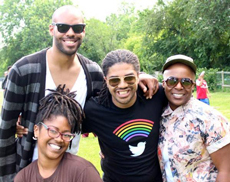 More than 250,000 men and women attend Black LGBT Pride events each year. DCBP is presented by the Center for Black Equity (CBE). The CBE is a coalition of Black Pride organizers formed to promote a multinational network of LGBT (Lesbian, Gay, Bisexual, Transgender) Prides and community-based organizations. Take a visual look back at #DCBP2015 ‪via some great photos photos by Rocky Ferguson.